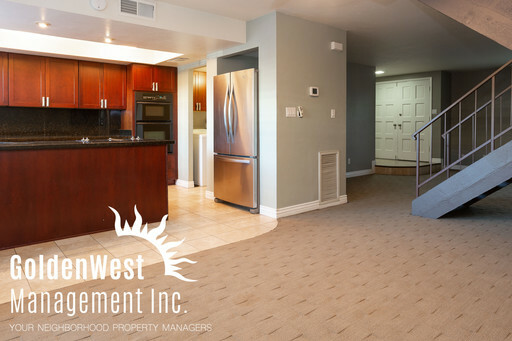 Elegant 3 Bdm 2.5 Ba Townhouse close to Old Town Scottsdale. Bottom story features a spacious open floor plan, cherry kitchen cabinets, granite counter tops and a black appliance package. First floor has large dual-pane windows, unique accents and neutral stones! Large half bathroom and full sized washer and dryer are included! Dining room opens to large stone patio which leads you to the carports. Upstairs are the two standard bedrooms and the huge master bedroom with a walk-in closet and private bathroom. There is a bonus room for office/play room of your choice. Further enjoy the private covered patio, your 2 covered parking spots located just behind the townhouse and newly rebuilt storage shed. Across from Community Pool and within walking distance to Chaparral Lake Park. No pets allowed. Water, Sewer & Trash Included! Electric: SRP. Schedule a showing today! Cross Street: Hayden/ Chaparral Directions: E on Chapparral, N on 83 St, E on Orange Blossom to property on the right. Did you know that you can enter this property yourself? See this property at your convenience by using our Self Showing feature.